Bubbles are fascinating. What gives them their shape? What makes them break or last? What causes the colors and patterns in the soap film, and why do they change? Bend the coat hanger into a flat hoop with the hook sticking up at an angle to serve as a handle. 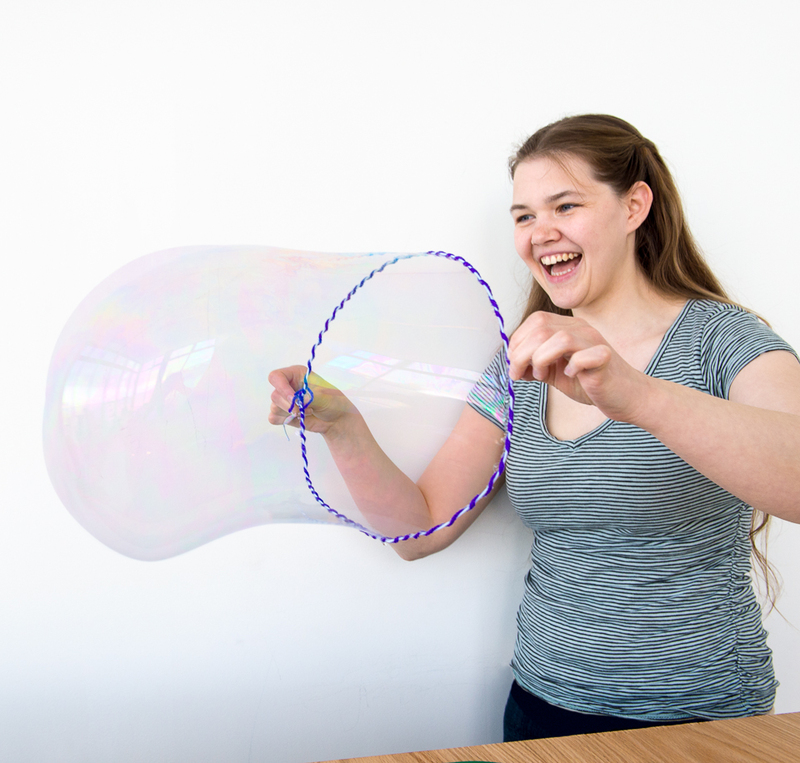 Bubbles will form more consistently when the hoop is as circular as possible. If you wrap yarn tightly around the rim of the hoop, the yarn will absorb the bubble solution, which will make the hoop easier to use. See our tip about bubble solution in the Tools and Materials section above. Fill the shallow tray with bubble solution and submerge the hoop in it. Tilt the hoop toward you until it’s almost vertical, and then gently lift it from the tray. You should have a bubble film extending across the hoop. Swing the hoop through the air to make a giant bubble. When you have a big bubble, twist the hoop to seal it off at the end. What shapes do the bubbles take once they are free of the hoop? 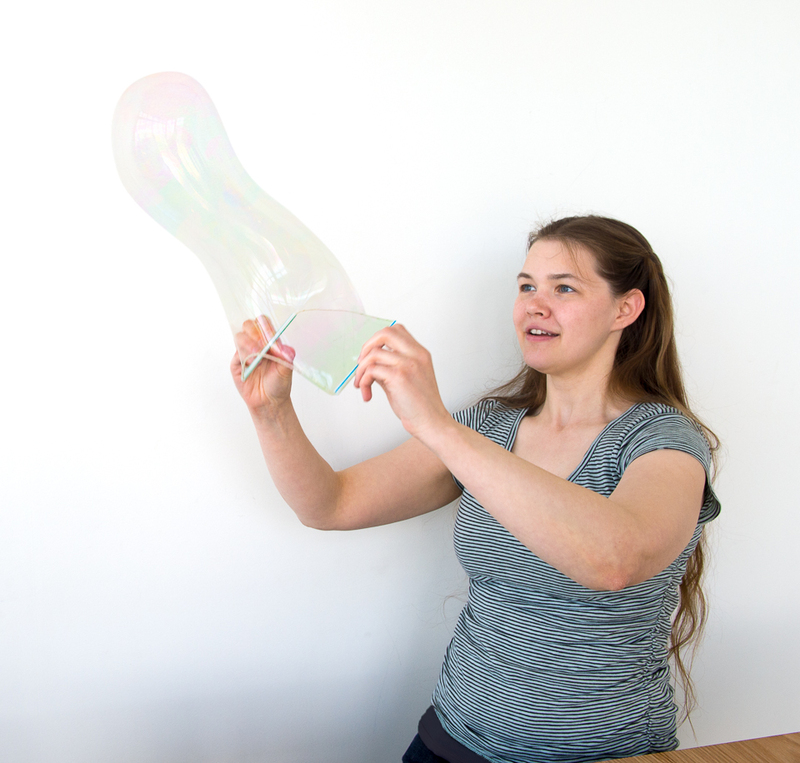 What roles do convection and air currents play in a bubble’s movement? Look for patterns and colors in the bubbles. Dip the hoop in the solution and hold the film up to the light without forming a bubble. What patterns (and changes in patterns) do you observe? The strong mutual attraction of water molecules to each other is known as surface tension. Normally, surface tension makes it impossible to stretch the water out to make a thin film. Soap reduces surface tension and allows a film to form. Because of surface tension, a soap film always pulls in as tightly as it can, just like a stretched balloon. The patterns of different colors in a soap bubble are caused by interference. Light waves reflected from the inner and outer surfaces of the soap film interfere with each other constructively or destructively, depending on the thickness of the bubble and the wavelength (that is, the color) of the light. For example, if the soap film is thick enough to cause waves of red light to interfere destructively with each other, the red light is eliminated, leaving only blue and green to reach your eyes.